Dalmatian pink cranesbill (Geranium dalmaticum) is petite in stature but carries a big footprint for usefulness in the garden. 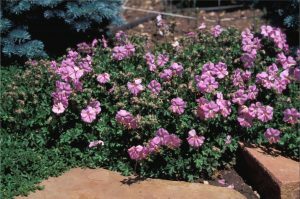 It is perfectly suited to use in the rock garden, where the low growing foliage serves as a wonderful ground cover and filler. It covers itself with pretty pink flowers in spring and early summer. It shines as a ground cover beneath shrubs providing a finishing touch to areas often neglected for planting. At the front edge of a perennial border, Geranium dalmaticum serves as a neat perimeter plant. The foliage has pretty scalloped leaves that set off the flowers. In late summer and fall, the leaves take on reddish tones and extend the season of interest into the weeks of autumn. When all is said and done, Geranium dalmaticum is a little workhorse of a plant. It will do well in sun or light shade and is very versatile as to where you want to enjoy it in your garden. desert moss and most of the other Plant Select Petites.